The 12-way relay switches independent input/output channels to form a one-to-one circuit. The control of each channel loop can be configured via software, each channel has a separate transient surge protection circuit, surge protection up to 25A 4s. Each channel allows 16A resistive load current, or inductive load current 8A, and supports the control of electric curtain motors. 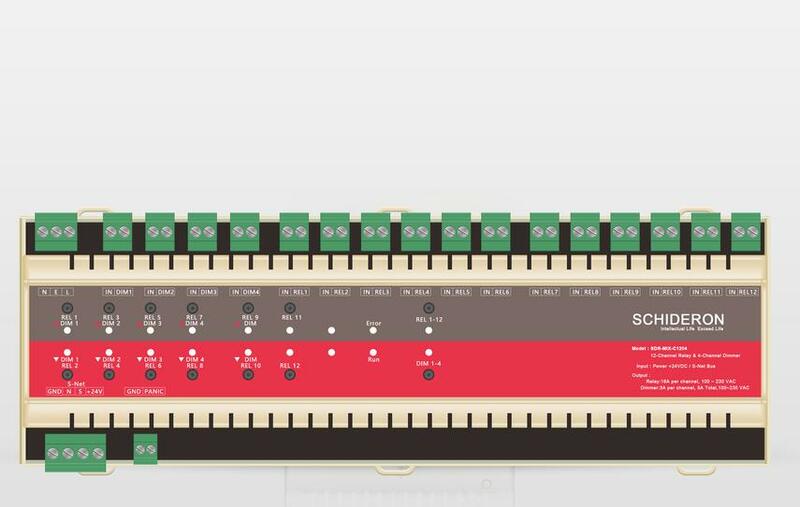 SCR dimming 4 channels independently isolated input and output. The control of each channel loop can be configured by software. Each channel has load current detection and can read the current value. The maximum load current of a single channel is 3A, and the maximum current capacity of all circuits of the module is 5A. The module is designed for the MCU pure hardware architecture and has local data processing and channel control. The overall power consumption of the module is low and the task processing is timely. The module communicates via a dedicated bus to ensure the stability and reliability of data transmission. Each module has a corresponding physical address. The DIP dialer can be used to set the module's address to ensure that each module can operate correctly and accurately receive and execute commands transmitted from the bus. The module dimming circuit has its own relay cut off in each circuit to ensure that there is no thyristor leakage after the circuit is closed, causing the lamp to flicker. The range of starting minimum voltage and output maximum voltage can be set by software. The module dimming loop has a single-phase zero-crossing detection circuit. The proprietary zero-crossing filter technology makes each opening/closing action of the module relay at the zero-crossing point of the frequency, thereby prolonging the service life of the device and reducing the flickering of lighting fixtures. Compensation circuit voltage and frequency fluctuations. The SDR-MIX-C1204 is a 12-channel relay + 4-channel thyristor dimming module. Including 16 manual emergency buttons: 8 for thyristor dimming; 6 for relay switching; 2 for full-open and full-close. 12-way 16A relay switch for 120VAC~240VAC switching and fan control for incandescent, fluorescent, neon/cold-cathode and other non-dimmable lighting fixtures, 12 independent input/output isolation channels, allowing no other bus devices and Manually switch the circuit in case of software. Each channel allows 16A resistive load current or 8A inductive load current and supports control of motorized curtain motors. 4-way 3A thyristor dimming is used for front phase phase dimming of front-phase electronic low voltage (ELV), incandescent (INC), neon/cold cathode (Neon/CC), electromagnetic low voltage (MLV) lamps and other lighting fixtures. control. The module has load current detection and each channel's data can be uploaded to the management center for graphical statistics. At the same time, it guarantees to cut off the power supply in case of over-current and prevent malfunction. The maximum load current of a single channel is 3A, and the maximum load current of all circuits of the module is 5A. The independent lighting control, pre-editing scene control and scene timing control can be performed through the intelligent lighting management system (LMS) visualization. The module data can be uploaded to the intelligent lighting management system (LMS) for module status management and data statistical analysis. The entire data transmission and equipment Control meets the latest industry standards.